First off, his is the same shell material as the With Teeth 2.5L shell jacket I reviewed a little while back, so I'm not going to repeat a bunch of that info here. Check out the first few paragraphs of that review for the goods on the fabric. Synopsis: Cocona Xcelerator technology for xtreme breathability and great water resistance in a supple fabric with a comfortable cut. No insulation, so be sure to layer up. Now, let's get to the pant specifics. The first thing I noticed about these pants was that thing on the right leg. They call it the Homeschool accessory holster and you can be skeptical all you want. I was. "I'm never gonna use it and it's gonna snag a tree branch and turn my new pants into basketball-warmup-style tear-aways," I said to no one in particular. Never happened. Turns out I actually use the thing. Every time. My gloves go straight in there whenever I take them off. They're easier to get at there than in a pocket, but still secure enough that they won't fall into the urinal. What about the rest of the pockets? Homeschool went with one back pocket on this pant. In reality, 'zero' is the correct number. 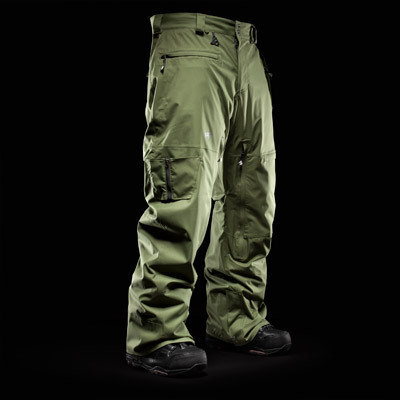 Maybe some fake pockets back there so it looks normal, but back pockets on snowboard pants are terrible. I never use them. Too much chairlift time (most shocking stat from Alpine Replay). While we're on negatives, the cargo pocket on the left leg is poorly placed. Whatever you put in it falls squarely on your knee. I never use it. Then again, I never need to. The two hip pockets are plenty. A note on fit, the 'Homeschool Engineered Fit' is neither tight nor baggy. I clock in at a 33-inch waist and 32-inch inseam and went with the medium. It fits as advertised. 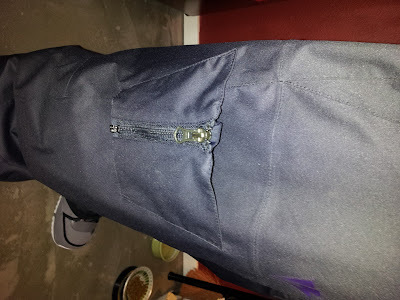 The waist has an adjustable inner velcro belt to tighten things as needed. Want ball-flattering tightness or gun-smuggling sag? Size up or down, use the belt or a sewing machine. Other details include zippered ghetto slits with snap-adjustable boot gaiters, full seam taping, mesh-backed inseam vents and some subtle yet stylish logo hits including a lift ticket 'ring.' The jacket to pant 'interface' is of the 'loop and snap' variety, so they include extra loops below the belt loops for that. Like I said in the jacket review, good but not great. These pants have given me zero problems this year, but at a retail price of $225, you might want assurance that they'll last a few years before you swipe that MasterCard. Unfortunately, that's something I can't give you. I've only ridden these pants about 15 days at this point. They still look like new. They still perform like new. Their longevity will play out over the coming years. For now, I can only give my recommendation. Give Homeschool a chance. Discover what real breathability feels like on a garment designed by Northwestern snowboarders. Check back for long-term updates in the "My Gear This Year" series to see how these and other products hold up to Father Time. I know this was posted up a while ago but I have been riding the revolve pant which is also the same fabric for two seasons now. I have 200+ days on them and they are still going strong. A little ragedy around the cuffs from parking lots but that all. Best pants I have ever owned! I do like back pockets though, I put my wallet there. And the flap design on all the pockets are genius, I have never lost anything out of them. Thanks Brek! You must have an inside line on those pants to be riding them for so long. It's good to hear that they are durable. It's the one thing you never know until you pony up the dough. I'm glad to finally hear from someone who has put them through some paces.